The social calendar of the average pre-schooler without doubt challenges the ‘coming out’ – a custom for girls in those days to enter into society by attending a variety of balls and dances in search of a husband – of the average Jane Austin heroine. At least the outcome for the Emmas of this world is a wedding; ours is an over-sugared five year old. This is our umpteenth birthday party this year. And as each outdoes the other in terms of child entertainment, the search for available and easy to use venues increases. The setting of the Blue Water Cafe restaurant is sublime. With incredible sweeping views over Long Beach, the restaurant rests in a garden where a huge tree plays host to swings and slides for little ones, and strategically placed (and newly painted) tables and umbrellas sit waiting for patrons and exhausted parents right before a paddock filled with horses and peacocks. The latter are in full swing, both verbally and featheredly. By this I mean that they are not shy about strutting around with their feathers theatrically on end. The staff are friendly and really on the ball, if balancing a decaf latté whilst making one’s way through a sea of children and managing to find the precise parent who placed the order, is anything to go by. And this accompanied by a gracious smile. I’m even allowed to charge my camera battery (as usual we’ve left home with our only means of capturing the important moment seriously hampered by lack of vooma). It rests alongside the wood fired clay pizza oven on the opposite side of the restaurant to the kitchen and one of the waitresses takes personal responsibility for looking after it, without being asked. The restaurant and animal feeding and petting area is a gift to some parents. As it was a gift to begin with too. A baron, by the name of Baron Gustav Wilhelm van Imhoff originally gave this piece of land (together with a lot more of it) to Christina Rousseau, a widow who grew vegetables for the fleets of ships that docked in the harbour of Simon’s Town. Back then the area, which included much of today’s Kommetjie and Ocean View, was known as Imhoff’s Gift. 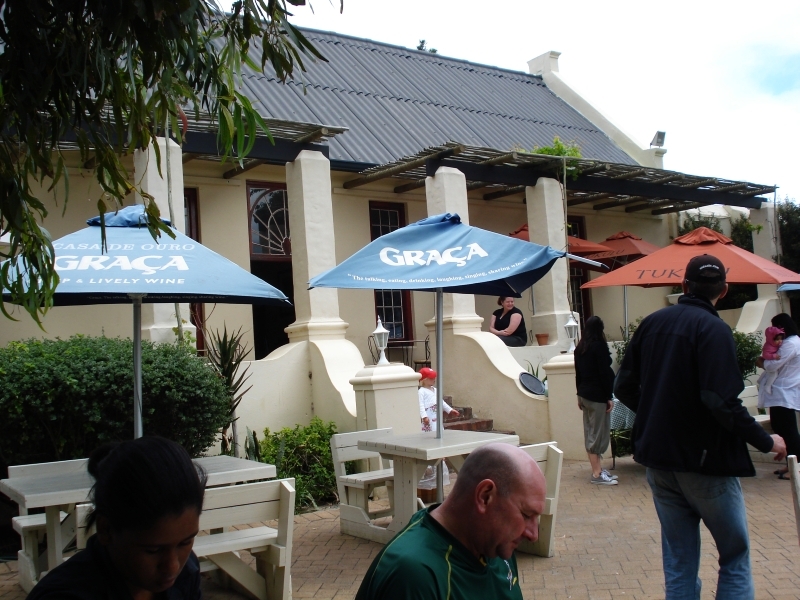 The point of this narrative is that the restaurant now serves from the original old Cape Dutch homestead. The other shops at Imhoff Farm are in the former stables, silo, smithy, slave quarters and milking sheds. There is a great deal of history here, which you can enjoy both inside the restaurant, outside on the grapevine enshrouded verandah, or in the garden under a brolly. Imagine the views from here when there was no development to speak of? The party package appears to include a number of plates of eats, and there are pizza slices and wholewheat scones with grated cheese, as well as juices for the children. I gratefully note that the only sugar is in the cupcakes that form a huge 5, for Matilda to blow out her candles. And each child receives a sticker to enter the animal feeding pen, known as Higgledy Piggledy, something we do later (although the attendants in the area are so strict about letting people in that the parents hastily avail themselves of stickers too). I sneak a peek at the menu. Were we not catered for, we could have partaken of a breakfast that is served right up until 12 noon and includes items such as a Sunrise Sundae – fruit, crunchy granola, yoghurt and berry coulis; a Farmers Breakfast – great to see that this comes with free range eggs (probably from the local hens strutting their stuff around us), farm bacon, sausage, grilled mushrooms and grilled tomato, an All-day Breakfast Tartine, which is a ciabatta version of the farmers breakfast with rocket; and items like omelettes, croissants, French toast and scones. Lunch is as generous. You can enjoy toasted ciabatta or farm bread with things like organic chicken breast, marinated smoked salmon, grilled Mediterranean vegetables or Karoo roast lamb. There are a selection of salads that look as interesting and main courses that include line fish of the day, the Blue Water beef burger, Cape Malay chicken curry, a farmhouse platter and a seafood pan. And of course, their bevy of wood fired pizzas, and desserts. Indoors is particularly pretty, and there are roughly three breakaway rooms that could easily serve for private functions and parties. During winter one would at least have a fireplace. I particularly notice the floors – each of them is beautiful – parquet or black and white tiles. The staff have a good thing going and there is a great deal of friendly banter. This bodes well for the atmosphere in the kitchen – warm hearted preparation means happily prepared food. Some restaurants have such a stressed atmosphere amongst the chef and his staff that I wonder the food goes down at all. And once the party is over, there is the rest of the farm to appreciate – the Free Range Shop which is something of a deli as well as a restaurant, a chance to buy chocolate, a number of gift and arts and crafts shops, a wine tasting shop, and then any number of other children’s activities like camel rides, the snake park, face painting and horse riding. And there is a nursery here for parents to pick up the odd plant or herb, with quite a selection of fruit trees. Good party, happy parents, happy children and a day out. More you can’t ask of a venue. Blue Water Café is open every Tuesday, from 9am until 5pm, and every Wednesday through to Sunday from 9am until late. Find them at Imhoff Farm in Kommetjie.